The Gong Show Goddess Can Sing! 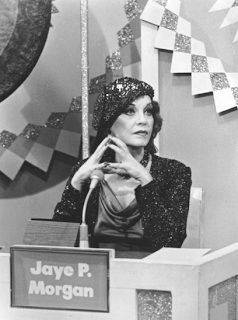 If you mention the name Jaye P. Morgan to anyone from my generation, they will undoubtedly think of "The Gong Show." She was a regular celebrity panelist on that show and for youngsters of the late seventies, we just accepted that Jaye P. Morgan was famous for something even if we didn't know what. We knew she could sing because she appeared on "The Muppet Show" and sang several songs including "That Old Black Magic". We kind of thought she was more than just a panelist on a game show when she played herself in an episode of "The Odd Couple" where Felix writes a song for her to sing in her lounge act. (the quirky "Happy and Peppy and Bursting with Joy"! When Jaye P. sang it, she slowed it down to a sultry ballad that infuriated Felix!) But it wasn't until I was going through my dad's record collection one day a few years back that I realized that she was, in fact, a true blue bone-a-fide songstress. For those of you who still don't believe it, here's a little background info: In 1951, a year after graduating from Verdugo Hills High School in Tujunga, Los Angeles, California (incidentally, this is where she was given the infamous moniker - she was her class treasurer and her peers named her after the famous banker Jaye P. Morgan - her real name is Mary Margaret Morgan) she made a recording of the song "Life Is Just a Bowl of Cherries" which made it to the Top Ten. Soon after, she received an RCA Victor recording contract and she had five hits in one year, including "That's All I Want from You," her biggest hit, which reached #3 on the charts. Other notable hits included "The Longest Walk" and "Pepper Hot Baby". From 1954 to 1955, she was a vocalist on the television show "Stop the Music." In 1956 she had her own television show, named for her, and guested on a number of other variety shows as well. She was a charter member of the Robert Q. Lewis "gang" on Lewis's popular weekday show on CBS, and was featured on a special episode of The Jackie Gleason Show in which Lewis's entire company substituted for the vacationing Gleason. After a period in the 1960s when she did very little in the entertainment field, confining herself to a small number of night club appearances, she returned to the public eye in the 1970s, mainly as an actress. This brings us to where we came in with her appearing on "The Odd Couple", "The Muppet Show" and, of course, "The Gong Show". To help you believe even more, I present for you that album that I found in my father's collection. Here is Jaye P. Morgan with her 1958 album, "Just You Just Me." Enjoy! One last note - the orchestra leader on this album is the legendary Frank DeVol - That's Happy Kyne to all of you Fernwood 2-nite fans! So go out and support your independent record dealers! "This Is The Killer Speaking"
A great clip from a BBC series entitled "The Old Grey Whistle Stop" from 1972. The end is the best part! Last May I posted what was to become the most downloaded album on this blog. I am speaking of MECO's "Star Wars and Other Galactic Funk". At last count, it had been downloaded 506 times and I'm sure that number has gone up even as I type this. After such a huge reception to that album, I feel only right in bringing you the follow up record from Meco. After the success of "Star Wars and Other Galactic Funk", Meco was being pressured by his record label into doing yet another disco album based on a film score. Unfortunately there weren’t any current or new movies that satisfied him. 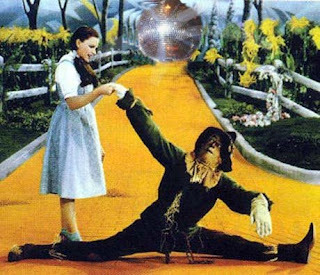 He woke up one morning singing “We’re off to see the wizard, the wonderful Wizard of Oz” and simply thought it was cute. He had seen it at least twenty times over the years and it was somehow buried in his sub-conscience. Unlike "Star Wars" where he only had about fifteen minutes worth of material, he soon realized that he had around eight good songs to begin with. Meco went back to his label and told them about doing “The Wizard of Oz” to which they laughed and commented, “the old Wizard of Oz at this point in time?” Before long Meco had them humming the old songs and they soon gave him the go-ahead to begin work. Around the same time, Meco’s old friend, Harold Wheeler had arranged a Broadway musical called “The Wiz.” The two got together and brainstormed for hours. They came up with about twenty-seven minutes of music, but because it was on two-sided vinyl it had to be cut in half at around the fifteen-minute mark. Now the second side was shorter so they decided to take the themes again and take out the Disco beat and leave just the orchestration. A John Williams style symphony so to speak for the last four minutes of side two helping to bring about a graceful ending. This was my first introduction to Meco. My father brought this album home and played it at dinner one night. I fell in love with it. It was and still is pretty darn cool in my book. Here it is for you now. Enjoy! 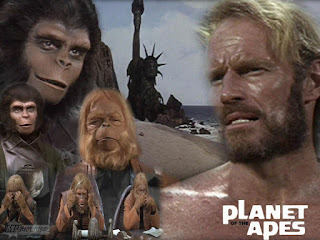 When I was a kid, Planet of The Apes was still pretty new in the world. One of the coolest tie-ins was a Power Records Album featuring dramatizations of the ape films. I still have it and am sharing it with you today! Enjoy! Marc Bolan and T Rex are among my favorites and was I first introduced to them by a friend of my high school girlfriend who worshipped Bolan. This girl honestly believed that Marc would appear in another form at one time. Kind of weird but she was pretty cool. Anyway, the first album that I was given to listen to was Electric Warrior. This should be standard listening for everyone and should adorn the collection of all audiophiles. It contains the biggest hit Bolan had in the states, "Get It On (Bang A Gong)" as well as classic radio cuts such as "Jeepster" and "Cosmic Dancer". Quite simply, it's the best T. Rex album, period. This could only get better when I discovered "The Electric Warrior Sessions" one day. This was a limited edition release with just 500 copies that were officially put out. The "sessions" include 12 outtakes and previously unreleased versions of tracks such as 'Get It On', 'Monolith', 'Cosmic Dancer', 'Life's A Gas', 'Honey Don't', 'Woodland Rock', 'Summertime Blues', 'Jeepster', 'Baby Strange' and 'Jewel'. 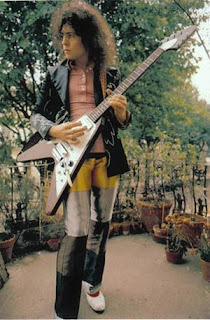 It is extremely cool even if you're not a big T. Rex/Marc Bolan fan. I present it here for you now. Enjoy!